Habit: Shrub; sap clear; [monoecious] dioecious. Stem: erect, generally much-branched. Leaf: cauline, alternate; hairs simple or stellate. Staminate Inflorescence: spike or raceme, axillary. Pistillate Inflorescence: terminal; flower occasionally 1. Staminate Flower: sessile or short-pedicelled; calyx splitting into 3--4 parts; stamens 3--25, filaments free; nectar disk minute or 0. 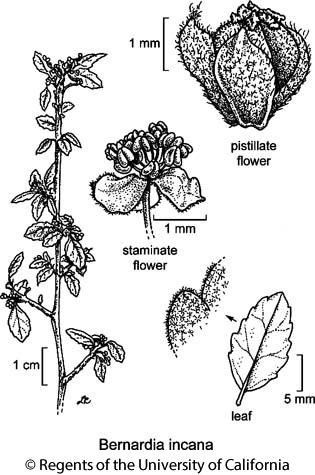 Pistillate Flower: sessile; sepals 4--6; nectar disk 0; ovary 3-chambered, styles 3, free, 2-lobed or -toothed. Fruit: 3-lobed. Seed: scar appendaged. Species In Genus: 30--40 species: tropics, subtropical America. Etymology: (Bernard de Jussieu, French taxonomist, 1699--1776) Note: Bernardia myricifolia (Scheele) S. Watson not in California. Habit: Plant < 2.5 m, hairy. Leaf: stipules +- 1 mm, deciduous; petiole 1--5 mm; blade 0.5--3 cm, elliptic, tip obtuse or rounded, margin crenate. Staminate Inflorescence: raceme; pedicel 3--4 mm. Pistillate Inflorescence: flower 1, sessile. Staminate Flower: stamens 12--15; nectar disk of small glands. Pistillate Flower: sepals 5, +- 2 mm, unequal; ovary tomentose, styles jagged. Fruit: 8--10 mm diam, tomentose. Seed: 5 mm, smooth; back ribbed. Citation for this treatment: Mark H. Mayfield & Grady L. Webster 2012, Bernardia incana, in Jepson Flora Project (eds.) Jepson eFlora, http://ucjeps.berkeley.edu/eflora/eflora_display.php?tid=15609, accessed on April 25, 2019.